Saint Guinefort was a 13th century dog that received local veneration as a saint after miracles were reported at his grave. His story is a variation on the well-travelled 'faithful hound' motif, perhaps better-known to Anglophones in the form of the dog Gelert. Guinefort the greyhound belonged to a knight who lived in a castle near Lyon . One day, the knight went hunting, leaving his infant son in the care of Guinefort. When he returned, he found the nursery in chaos - the cot was overturned, the child was nowhere to be seen and Guinefort greeted his master with bloody jaws. 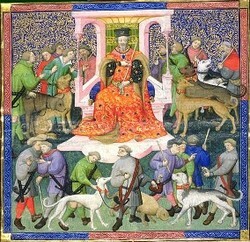 Believing Guinefort to have devoured his son, the knight slew the dog. He then heard a child crying; he turned over the cot and found his son lying there, safe and sound, along with the body of a viper. Guinefort had killed the snake and saved the child. On realising the mistake the family dropped the dog down a well, covered it with stones and planted trees around it, setting up a shrine for Guinefort. Guinefort became recognised by locals as a saint for the protection of infants. It was alleged by Catholic commentators, dismayed by the worship of a dog, that the locals sacrificed babies at the site. The cult of this dog saint persisted for several decades, until the 1930s, despite the repeated prohibitions of the Catholic Church. Thanks to Derek the Ænglican, commenting at Unlocked Wordhoard.